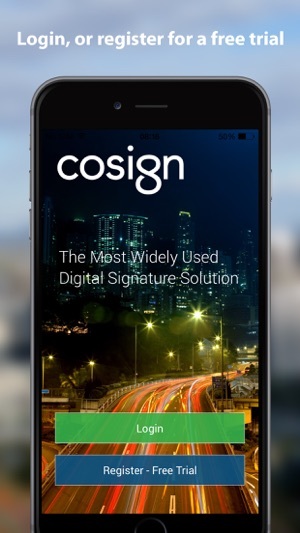 CoSign is the most widely used digital signature solution with millions of people around the world using it to quickly add secure digital signatures to their business documents. 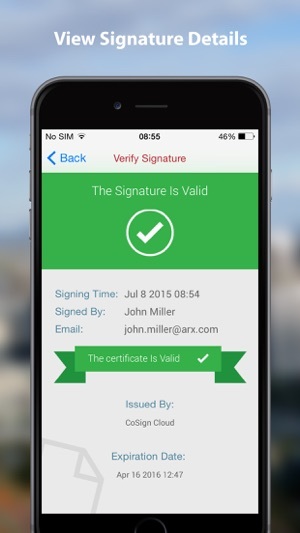 It was also recognized as “the strongest digital signature solution” in Forrester’s E-Signatures report. Want to learn how to avoid the hassles of signing with pen & paper while lowering your costs and improving document security no matter what you do or where you work? 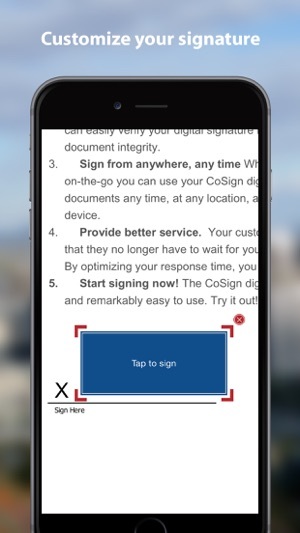 Try the CoSign Mobile App - the easiest way to securely sign your documents on the go using tamper-proof digital signatures that ensure both signer identity and document integrity. 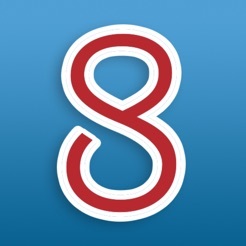 Download the CoSign Mobile App to try it out for free or to add it to your existing CoSign account. 1. 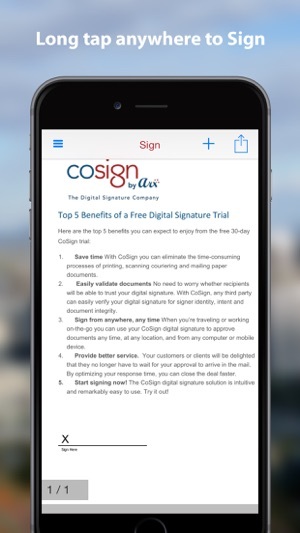 Open the document you want to sign in CoSign from your cloud storage, your email, or from any other app on your mobile device that handles PDF files. 2. Add your legally binding signature to the document in preset locations or add your own locations anywhere in the document. 3. Share the signed version with any mobile app that handles PDF files such as an email client (to send it as an attachment) or a cloud storage service (to save the file for future use). • Create your graphical signature by sketching your signature on the screen (by hand or with a stylus), typing it in as text, or uploading it from an image file. • Select the info you want to include in the signature, such as your reason for signing, your title, and the date and time of the signature. 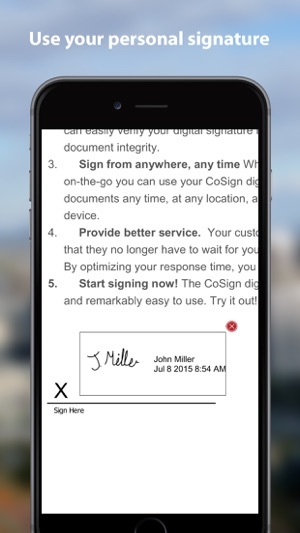 So how do you benefit from the CoSign digital signature app? Just got the app. It did not assign aa user id so I used the trial plan to set it up. Every attempt rejected due to inaccurate user id. There was nothing for the system to compare it to so I'm not sure how it could be wrong. I finally gave up.